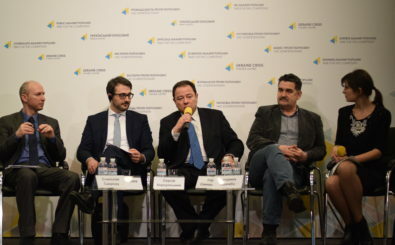 Israel’s Experience of Nation-Building: Lessons for Ukraine – Центр "Нова Європа"
On June 12, 2018, New Europe Center and Ukrainian-Jewish Encounter held the conference “Israel’s Experience of Nation-Building: Lessons for Ukraine”. The purpose of the conference is to share the Israeli experience in various fields of state-building with Ukrainian civil servants and civil society. Ivanna Klympush-Tsintsadze, Vice Prime Minister for European and Euro-Atlantic Integration of Ukraine; Eli Belotserkovsky, Ambassador of Israel to Ukraine; Daniel Meridor, President of the Israel Council on Foreign Relations, Deputy Prime Minister of Israel (2009-2013); Georgii Logvynskyi, Member of Ukrainian Parlament, co-chair of the Ukraine-Israeil interpariamentary cooperation group. Among Israeli participants was Ron Prosor, Representative of the State of Israel to the United Nations (2011-2015), Robert Singer, Executive Vice-President of the World Jewish Congress, Dan Mariashin, Executive Vice President of the Jewish Human Rights Organization B’nai Brith International, Rabbi Michael Melchior, Former Minister for Diaspora and Social Policy and Deputy Foreign Minister of Israel, Dan Meridor, President of the Israeli Foreign Affairs Council, Minister of Justice (1988-1992) and Vice Prime Minister (2009-2013) of Israel, Major General Yaakov Amidror, Chairman of the National Security Council of Israel (2011-2013), Einat Wilf, public intellectual, Member of the Knesset (2011-2013), Paul Grod, President of the Ukrainian Canadian Congress, Andrew Srulevitch, Director of European Affairs of the Anti-Defamation League. During the conference was discussed national security and human rights, language and education policies, countering misinformation and promoting state image abroad, Israel’s experience in defense, innovation and interactions with the diaspora.